Spend an evening at the one & only Al Khayma Desert Camp in Dubai to experience the bygone Bedouin life. Revisit those good old days with Shisha, Henna, Arabian makeover, Barbecue dinner, local Tanoura & Belly dance shows. - Dry days: entertainment activities (Tanoura dance and Belly dance) will not be available during the mentioned dates 3 & 20th April 2019 / 6, 22 & 25 May 2019 / 1, 3 & 5 June 2019 / 10,11 & 31 August 2019 / 9 September 2019 / 3, 9 & 30 November 2019 / 2 December 2019 or any special Islamic days as per UAE law (Date may vary as per the UAE law and Season time). - OceanAir Travels shall not be responsible for any kind of loss, accident, sickness or injury. It is advisable that the traveler should avail a travel health insurance as there can be chances of potential risks and hazards. Also, make sure they are mentally and physically able to participate. Our Safari Captain will pick you up, from the hotel or selected location, in a 4 wheel drive Land Cruiser. You will then be taken to the Lahbab desert. 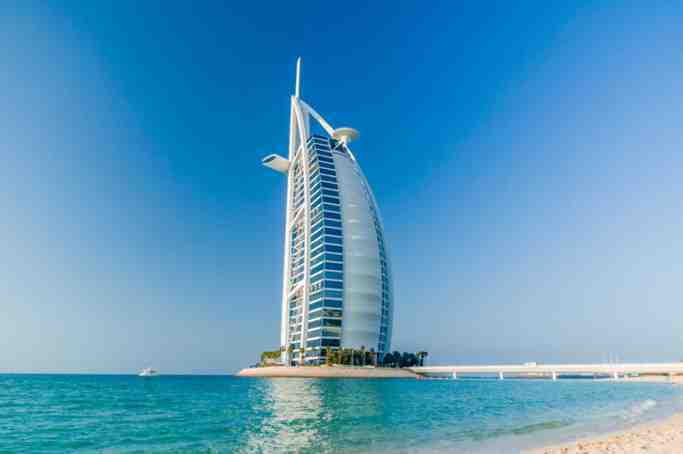 In that 01 hour drive, learn how the present cosmopolis Dubai was originally a village first and the way it transformed to a trendsetting city.As you arrive at Lahbab desert, take an initial break at the rest area for about 20-25 minutes. There you can take rest, avail bathroom / toilet facilities, meanwhile, your Land Cruiser gets its tyre pressures adjusted for the safari ride. Even as other convoys join your gang, you can go for an optional Quad Biking. 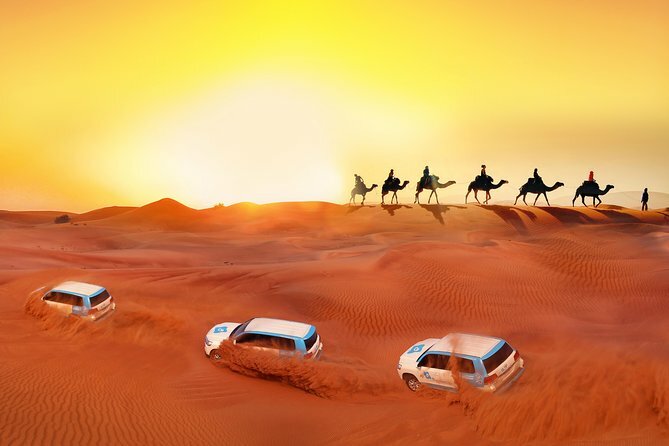 Soon the adventures begin with dune bashing in Dubai desert.... Go for a dune drive through the peculiarly shaped red dunes in Lahbab. After 30 to 45 minutes of dune bashing ride, keep your thrills up with sand-surfing along the dunes (sandboarding). Afterwards, we will proceed to Al Khayma desert camp.At the Al Khayma camp, you can see Camels in a group - ready for a ride. As you enter in the camp, our Safari Captain will show you the slots (where main camp activities take place), then you will be lead to a table inside / in front of your tent (Khayma). Unlimited supply of soft drinks, in addition to Arabic clothes (Abaya and Kandora - for ladies and gents) will be ready in your Khayma. Get welcomed with Gahwa & Gaymat (Arabian Coffee & Sweets) and dry dates. Refresh before you move on for next activity - Camel ride. It’s now time for ‘desert ship’ ride.... Take a ride experience in the group, which can be repeated. Also, watch the sunset from the camp’s dedicated sunset dune. Get these beautiful scenes captured with your cameras.Use your free time to the best in Al Khayma by trying out special Bedouin activities - the must things to do in Dubai Desert - Henna tattooing, Smoking with Shisha, Putting on Abaya / Kandora like a local Arab, Meeting up with a Falcon expert and posing with that majestic bird. Time for evening entertainers... First, a Tanoura dance will be performed at the center stage. Soon you will be invited to a barbecue dinner buffet. Have a fulfilling dinner with barbecue dishes. After dinner, you can taste the desserts provided. The next entertaining show will be Belly dance. Relaxation time.... as all entertainments get over, camp’s lights will be switched off completely to set a typical night desert ambiance for you. Relax or refresh yourselves by meditating. Watch the vast sky, the lucky ones can spot a few stars! Finally, you will be dropped off to the hotel / selected location.